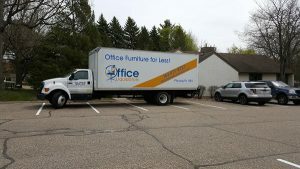 Office Liquidators in house delivery team offers low cost “one price” $85 delivery and installation usually available within days of your order. We can deliver anywhere within the five state area and also offer nationwide direct delivery of most products at no additional charge. We also offer moving services with one truck or two and many storage solutions. Additional charges for some panel installations and deliveries further than 40 miles may apply.